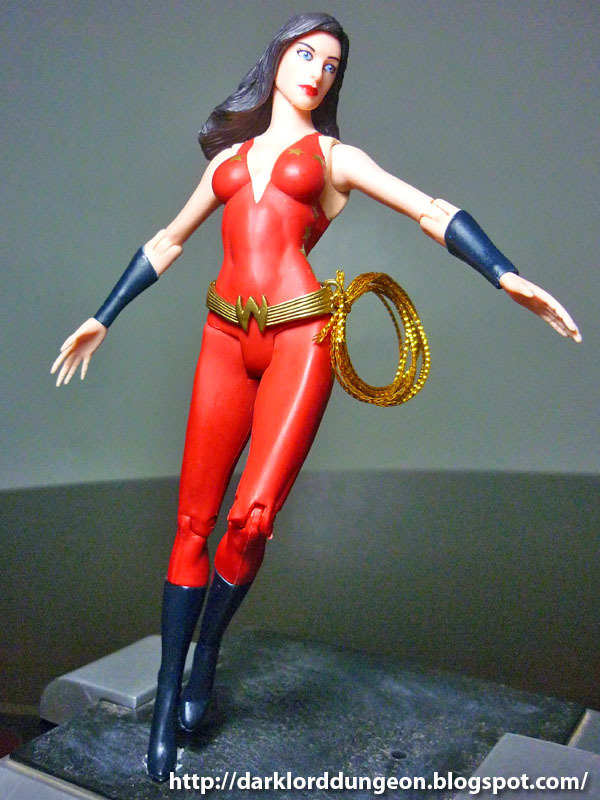 Presenting the DC Direct Kingdom Come Wonder Woman. I'm actually quite fond of both Kingdom Come and the Kingdom Come cast. I like it because it completely humanized the DC hero pantheon: Even heroes have to get tired of constantly battling an unending stream of hatred; Even heroes get hurt and have to retire; Even heroes grow old; Even heroes fail. 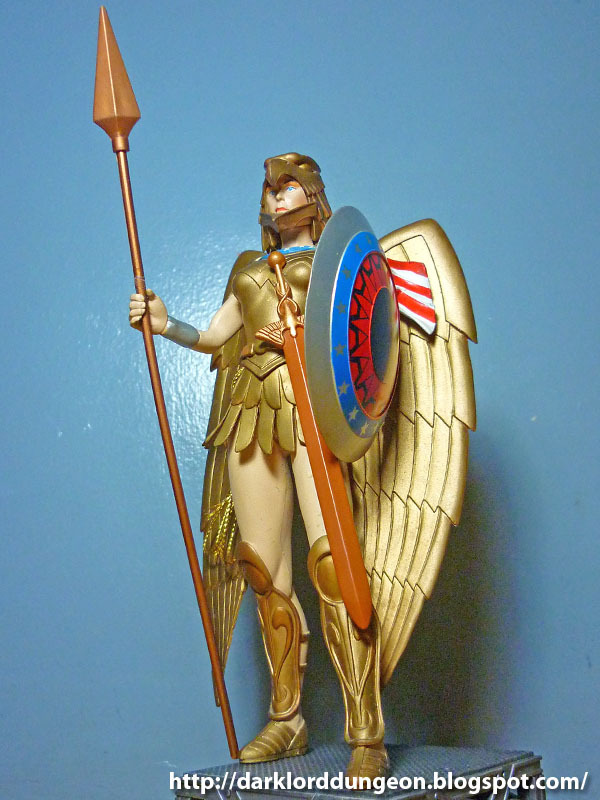 So here is Wonder Woman. Wonder Woman is not so "wonderful" anymore. She's living with the frustration of having been stripped of her "Princess" title by the Amazons for failing to bring peace to mankind. So she turns to what she knows best: being a warrior. Unfortunately Wonder Woman was never the leader that the inspirational Superman was - who is now retired and in hiding - nor is she the intimidating leader Batman is - who is now injured, has turned Gotham into a Big Brother playground and is hiding in the ruins of his cave. So her frustration over the state of the world continues to build. 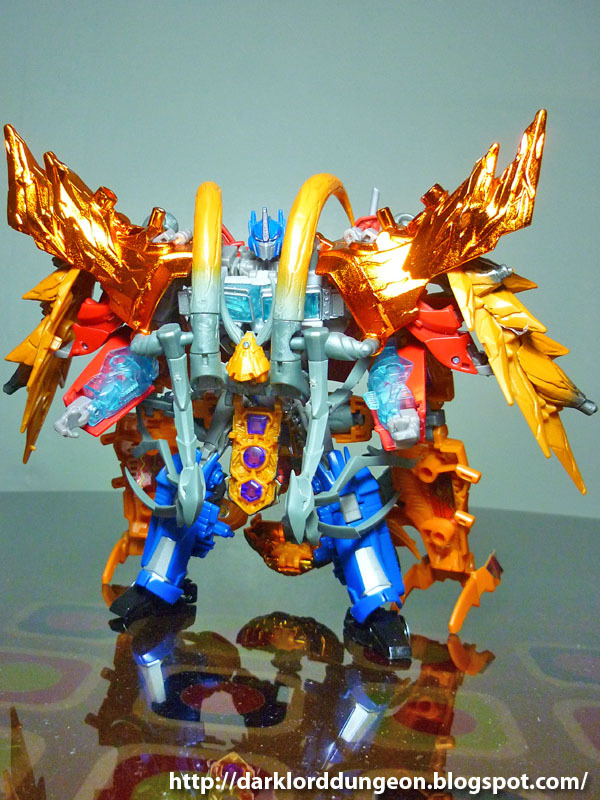 Presenting the Transformers Takara Gaia Unicron AM-19 - depicted here combined with the Transformers Prime RID Voyager Class Optimus Prime. Now if you follow the Transformers Prime animated series, you will see the mountain "Golems" made by Unicron that took on the unlikely tandem of Optimus Prime and Megatron. The real Unicron is actually at the center of the Earth. The original 13 Primes beat the crap out of Unicron and sent him into stasis out of the orbit of Cybertron. His mass was so big his natural gravity gathered debris around him and eventually he became the planet known as Earth..
Unicron is also known as the "Chaos Bringer", the "Anti-Spark" and the source of all Dark Energon - Ironically he has the power to resurrect the dead and Earth is such a green place. 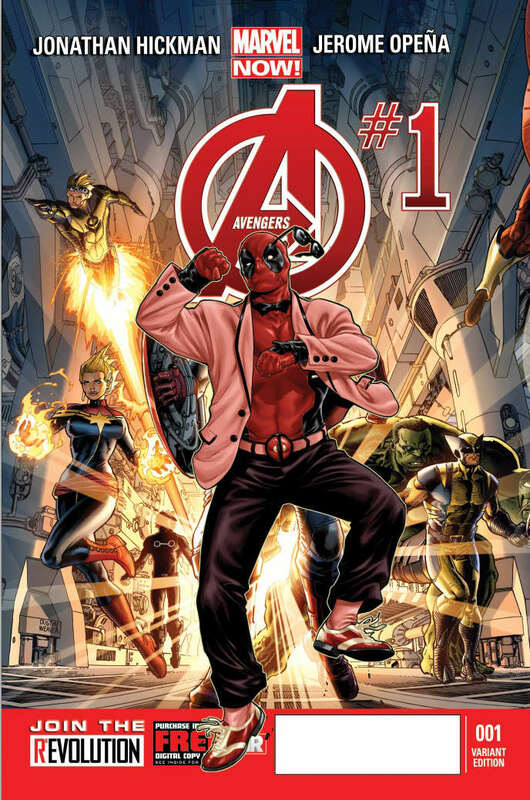 You know that South Korean rapper Psy is a god when not only has he danced with the likes of Madonna - who prostrated herself before Psy - but when his signature dance move "Gangnam Style" ends up on the cover of Marvel's greatest new premiere Avenger # 1 (Worth around US$ 100). 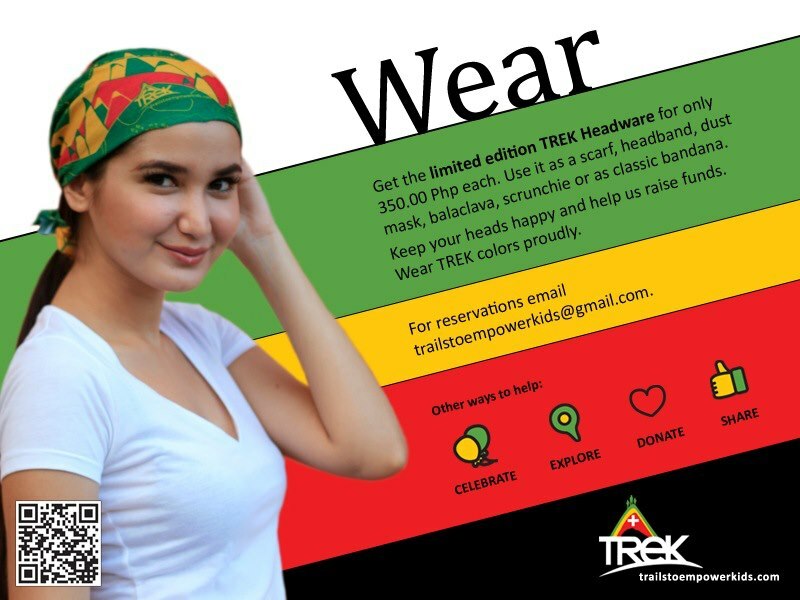 Give something back this Christmas by supporting the TRails to Empower Kids (TREK) - a group of mountaineers who's advocacy is to travel to the boondocks of the Philippines to help the uplift the lives of underprivileged kids by bringing with them school supplies, books, toys and the like. A simple donation of PhP 350 (Approx US$ 8.53) will not just gain you a limited edition TREK Headwear that can be used as a scarf, headband, dust-mask, balaclava, scrunchie or something you can simply use to wipe the dust off your toys; you will be helping TREK continue to help kids expand their minds, borders and worlds. 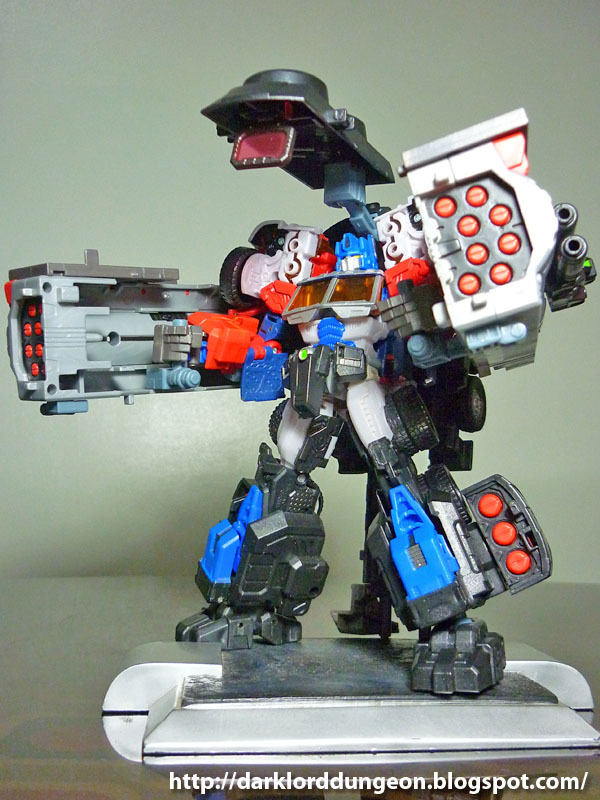 Presenting the Transformers Battle Tanker for the G2 Laser Optimus Prime that is NOT from maketoys.jp as this is the knock-off version of a non-canonical reportedly unauthorized accessory pack for the G2 Laser Optimus Prime. 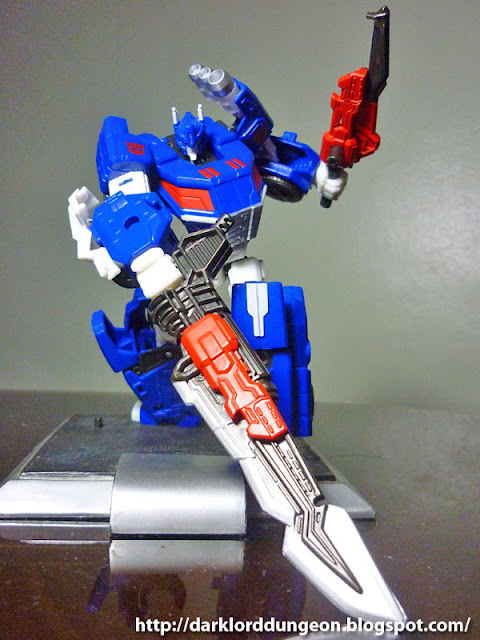 If you read my review about the G2 Laser Optimus Prime, then you'll know that I considered it one of the most horrible Primes ever made: He's short, stocky, tackily colored and is supremely uninspiring. Hell I even said that I preferred the Beast Wars Surfing Gorilla Prime over the G2 Laser Optimus Prime. But I did buy him because I knew that the Battle Tanker was just around the corner. And it finally did arrive. But shortly after the Maketoys Battle Tanker arrived, I found out that there was a Chinese Knock-Off version circulating which was... well cheaper (Literally half the price). So I said what the hell, let's check it out. Don't read this if you're a fan of the HALO series and haven't finished it yet. I've recently noticed the spike in people visiting my review of the Halo 3: Cortana figure. I was wondering what all the sudden interest was all about. Then I finished Halo 4, and I was absolutely thrown into a depressing fit. It's just not fair! It's not right! I've been fighting side-by-side with Cortana since 2001! I don't get how the Master Chief can go on knowing that he made a promise to a girl that he can't keep when he promised to get her home and that everything will be alright. Such a dumb ending to a wonderful series. Almost as stupid as the ending to Mass Effect 3. A major F U to 343. Presenting the Transformers Prime Star Hammer AKA the Jackhammer. It actually took me a while to find any information on the Star Hammer despite the fact that I've seen it in action in the cartoons. The reason being that I had not paid attention to the Transformers Prime cartoons enough to realize that the Autobots referred to Wheeljack's one-man space exploring craft as the Jackhammer not the Star Hammer. I'm not really sure where or why someone decided to change the name. It probably has something to do with Star Hammer being a class of ship and Jackhammer being the name of the ship - in the same way that a lot of people are confused with Firefly (ship class) and Serenity (Ship name). 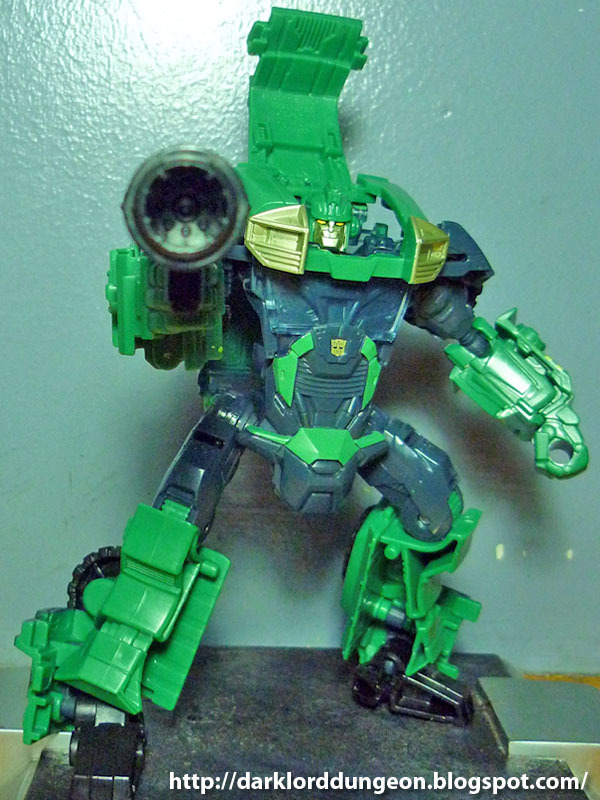 The Jackhammer obviously gets its name from its owner and loner pilot, the former Wrecker known as Wheeljack AKA "Jackie" (Thanks to Bulkhead). The Dungeon would like to extend its congratulations to the 44th President of the United States Barack Obama, for winning his reelection bid and proving Steve Jobs wrong (You'll be a one-term president indeed). 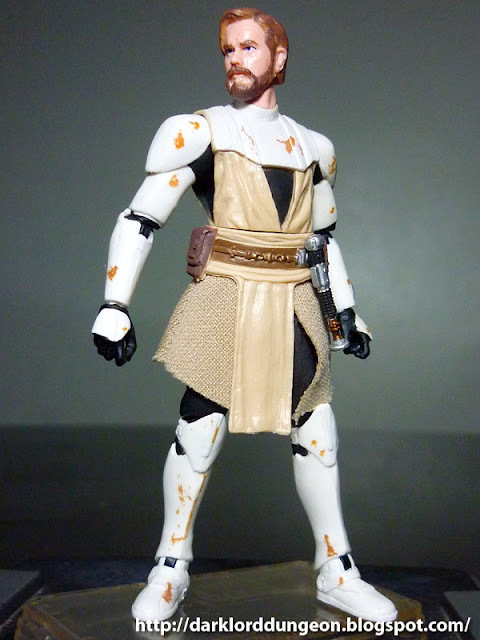 Presenting General Obi-Wan Kenobi from the Star Wars The Clone Wars toyline. I have to admit that I'm not much of a fan of Obi-Wan Kenobi. Personally I think that the entire Star Wars thingamajig. I really think that "IT'S ALL OBI-WAN'S FAULT!!!" and not just because Anakin Skywalker thinks "HE'S HOLDING ME BACK!!!" My personal argument against Obi-Wan goes all the way back to when Anakin Skywalker was just little orphan Annie. Jedi Master Qui-Gonn Jinn - despite being a Gray Jedi - followed the Jedi council's orders NOT to train Anakin Skywalker in the ways of the Force - at the very least he was willing to defer the debate. But NOOOO!!!! That's not good enough for Obi-Wan! With or without the council's permission, the newly minted Jedi Knight vowed to train Anakin Skywalker. Had he not been that adamant, perhaps there would not have been a Darth Vader - nor an Order 66 as the Emperor would have fallen to Mace Windu. So yeah. It really is "All Obi-Wan's fault!" Presenting Wheeljack from the Transformes Prime toyline. 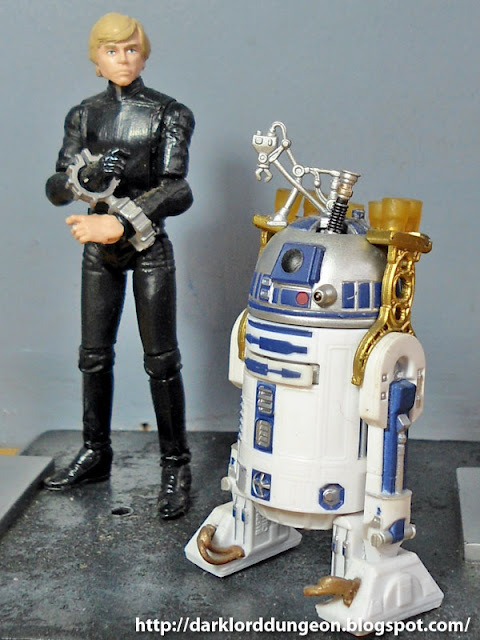 I've actually had this particular figure for quite some time and the fact that I'm just reviewing him now is a fine example of how much backlog I have. 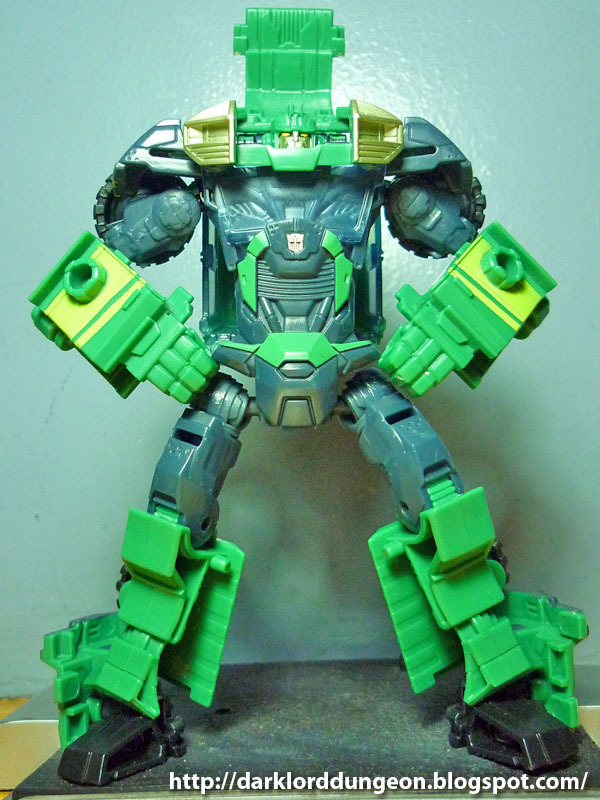 "Jackie" here - as Bulkhead likes to call him - is a former Wrecker. This is the first time that Wheeljack has been listed as a member of the Autobot suicide slash extermination squad. 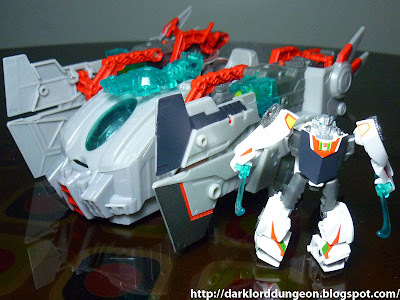 Because of this, the Transformers Prime Wheeljack actually has a personality that deviates from his traditional peace loving, pacifistic scientist who works well with others and created the Dinobots. No. 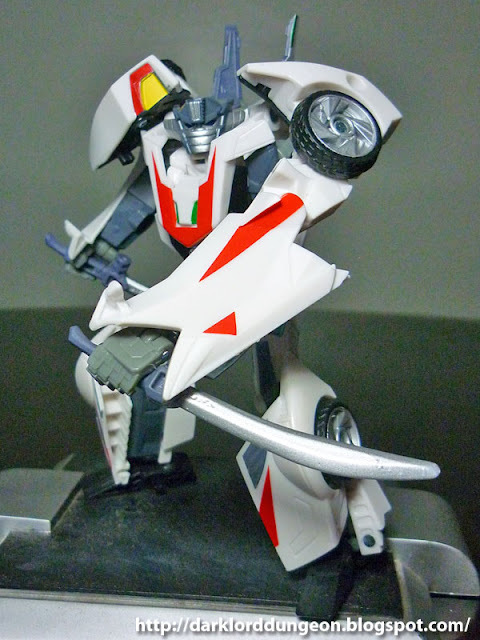 This Wheeljack has a personality akin to Dr. Nemesis, the mad Nazi-hunting scientist who was recruited into the X-Men: He doesn't work well with others, has no moral qualms about ending a life - especially in the name of science - hyper intelligent, and like sharp object because they cut things - Decepticons - open. Almost a year ago, I showed this picture from the Singapore MINT (Moment of Imagination and Nostalgia with Toys) Museum of Toys. My wife and I stumbled quite accidentally on this signage that we also featured a mere month before that read: "Whoever has the most toys when he dies wins." We had no idea that it was in the MINT museum so it was pure coincidence that we found it. A year later, I realized that I never featured the museum. 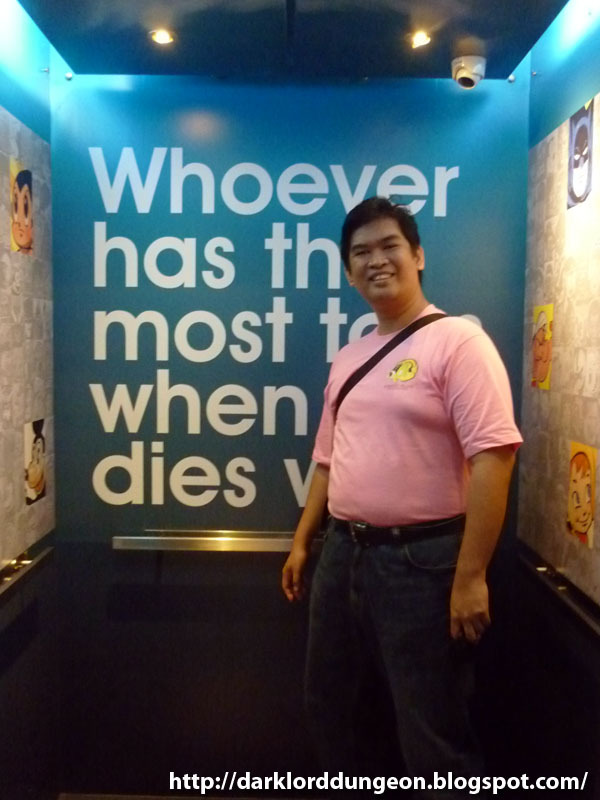 And that would be a shame considering that visiting a toy museum may not rank that high when visiting Singapore, but as toy collectors, it is important for us to know and recognize our heritage, our history, the toys that paved the way to what we have today. 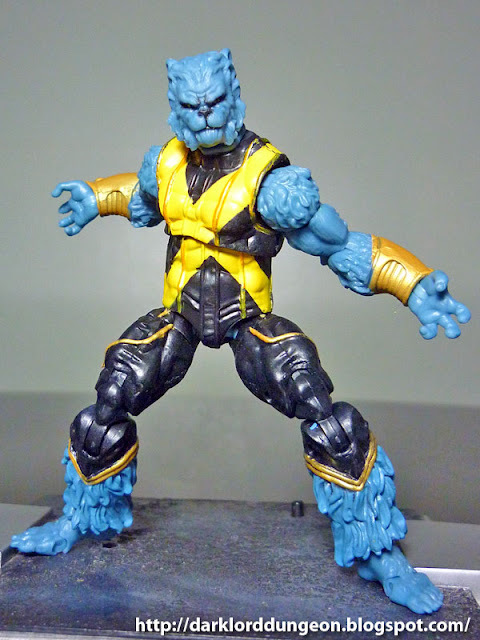 Presenting the Beast from the Marvel Universe Toyline. Mama McCoy's Bouncing Baby Boy has been many things in his most auspicious career since his creation in the 1960s: Student; X-Man; world renown doctor of Biochemistry ; one of the 10 most brilliant men in the comic lore (According to Businessweek); creator of the cure for the Legacy virus; X-Terminator; space-faring member of S.W.O.R.D; Defender, Secret Avenger, and the first X-Man to become a full fledged Avenger. He is one of the most beloved comic book heroes ever to come to life in the pages of Marvel comics. But what I, and a lot of other fans love the most about him is his constant struggle to actually control "The Beast" inside. More often than once he's been provoked into bloody act of carnage, falling prey to the bestial nature of his mutation. Yet he does bounce back - suppressing his animalistic rage beneath one of the most pacifistic, sunniest and brightest personalities in the Marvel Universe. In other words, I love him because he never loses hope. Toy News: Toy Kingdom Toy Warehouse Sale! The first - and probably MOST important Toy Sale of the Christmas Season here in the Philippines happens on November 2 to 4 (MY BIRTHDAY!!! 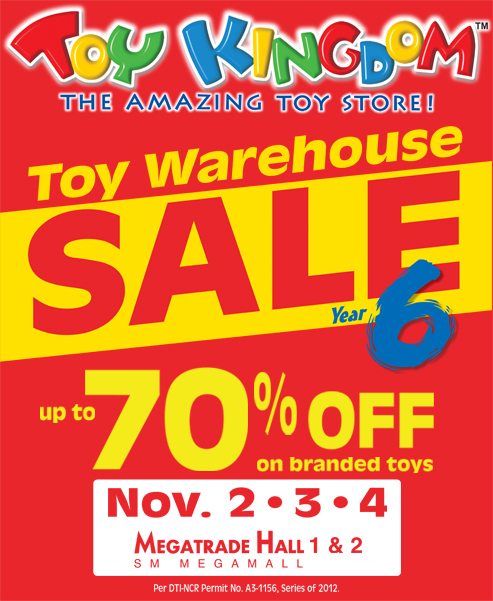 ), 2012 in not ONE, but TWO Megatrade Halls of SM Megamall, as Toy Kingdom holds it's 6th annual Toy Kingdom Warehouse Sale! 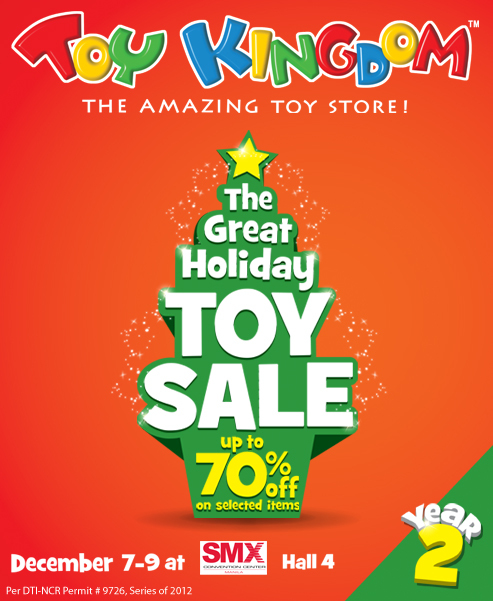 If you're looking for up to 70% off on branded toys, gadgets and games, then the Toy Kingdom Toy Warehouse sale is the place to be. SO MARK YOUR CALENDARS!!!. For more information, do remember to like Toy Kingdom's Facebook page, follow their Twitter feed or call 638-TOYK (638-8695). Presenting AZ Powergirl. If Powergirl were to jump out of the comic books and become a real person, THIS is what she would look like! Operating out of Phoenix, Arizona, AZ Powergirl is really Cara Nicole, a tough pretty blonde who is really.... gifted. Her website azpowergirl.com, has this to say about her: "Born in Colorado, Cara Nicole developed a love for comic books, a passion for acting and talent for singing very early on. In her pursuit of her acting career she discovered the world of cosplaying in which she had instant recognition and she has become very involved in the comic book and pop culture community as an spokesperson, booth babe and prominent figure in local Cosplay and art circles. She has been involved in independent films and has a lead part in the detective’s lover slated to premier in 2012. Cara is also intellectual, humorous and a pleasure to be around despite being a TOTAL.DIVA." 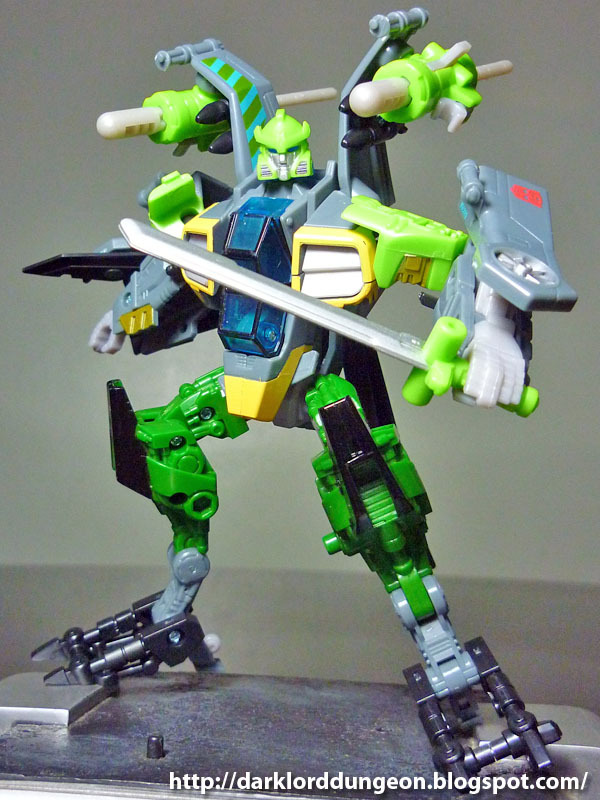 Presenting the Transformers Generations Asian Exclusive Springer. For those of you who regularly follow this blog (Really? there are people who regularly follow this blog? ), you've probably noticed the drop in recent posts. That's because I've uprooted my family and moved her 20 kilometers closer to where I work where I will no longer have an excuse not to exercise because now I have to walk to and from work instead of spending four hours stuck in traffic. So you're probably gonna notice some changes with my photos. Anyway, this is the redeco of the Transformers Hunt for the Decepticons Tomahawk re-colored, issued a new head, given a sword and renamed as the Transformers Generations Asian Exclusive Springer. Presenting the Mighty Ultra Magnus from the Transformers Prime toyline also known as the Powerizers Ultra Magnus. 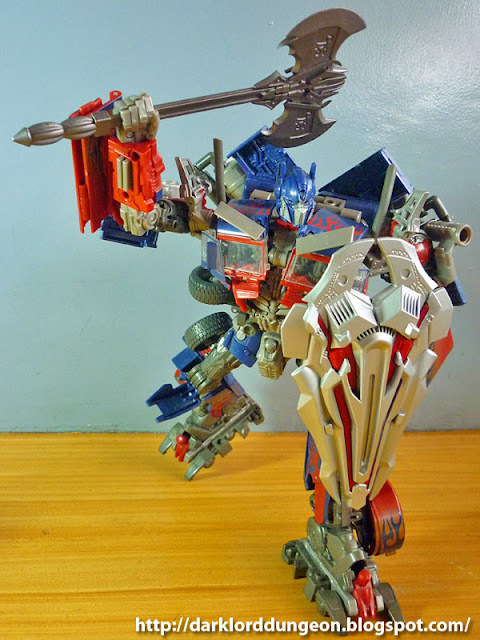 Ultra Magnus has yet to make his appearance in the Transformers Prime cartoon, but rumor has it that he will be the Hammer Swinging Leader of the notorious Wreckers - a group of Autobots that take things to the extreme i.e. they take the battle to the Decepticons versus Optimus Prime's less aggressive "Circle the Wagons" philosophy. The Wreckers also believe that the only good Decepticons are the dead ones. Members of this notorious band of cannon fodder include such well loved Autobots like Bulkhead and Wheeljack. But seriously, who wouldn't want to follow a hammer wielding giant? 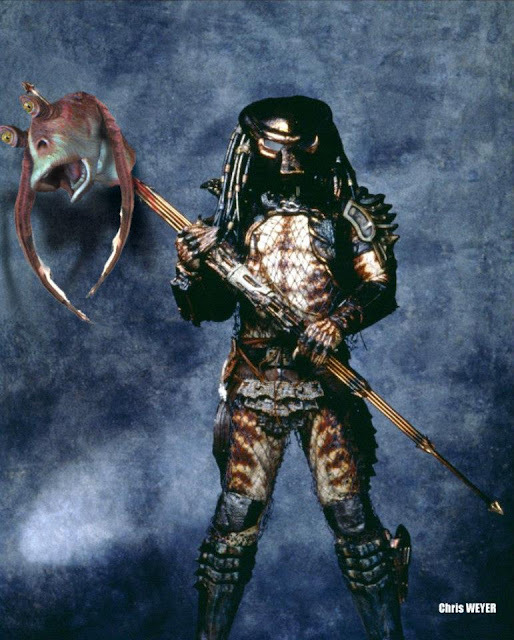 I hate Jar Jar Binks. I'm one of those people who wishes he could go back in time, hack George Lucas' brain and erase the very concept of a comic relief Gungan. I mean seriously The Gungans sent THIS to the Galactic Senate? This is the cause of the Galactic Civil War? I rue the day that he got into Qui-Gon Jinn's way. So I was quite happy when I came across the works of Chris WEYER, and his Facebook page Chris WEYER courts-métrages. 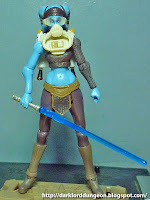 Presenting the Star Wars Clone Wars Vintage Edition Ahsoka Tano. 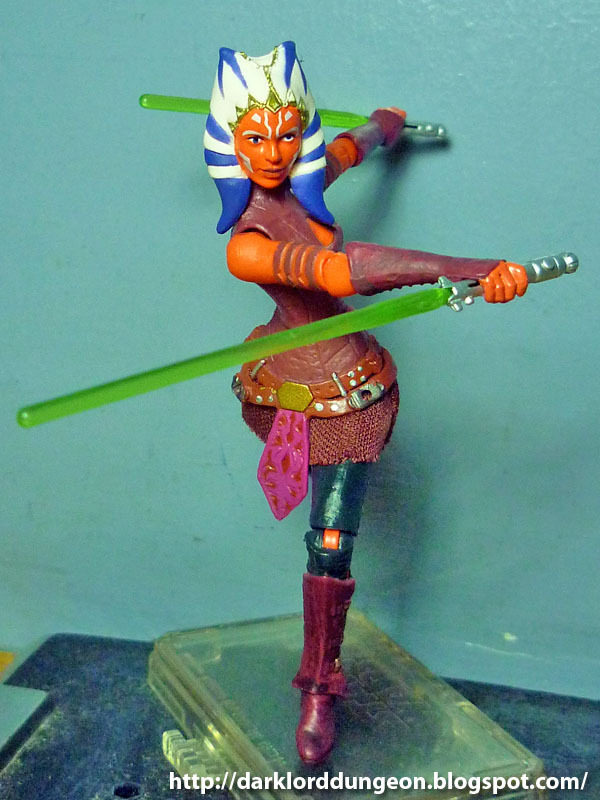 This is the first non-animated version released by Hasbro of the Jedi Padawan Ahsoka Tano AKA "Snips" (As she was less than affectionately named by her Master, the Jedi Knight Anakin Skywalker because of her fiery, upstart personality). This version of Ahsoka actually appears older than the juvenile Padawan presented in the Clone War Series (You'll see the comparison later in this review) which I think is more befitting for not just her role as the overtly aggressive, rebellious and oftentimes disrespectful Padawan; but also for her being one of the few Jedi to have stood toe-to-toe with both General Grievous and Asajj Ventress. It just simply did not make sense that a newbie pre-pubescent not as strong in the Force as the bright boy Anakin, to hold her own against enemies that have slain Masters. It made more sense if she were a teenager which she is in this incarnation. This is an erratum for Transformers Prime Sergeant Kup involving Kup's massive groin area that we complained about and made you all look at in the main review. The erratum stems from my statement that "his huge groin area (the "wings" on his groin) - it almost looks like his junk is sooo big he has to walk permanently with his legs open." Happily "Sprocketman" on Tumblr - check out Bumblr on Tumblr - pointed out that I missed a step in transforming him and had failed to lower Sergeant Kup's legs properly. Now because the spanking new Philippine Cyberlaw we're protesting, I can actually go to jail for making the main review and stating something that apparently is false. So if I ever go off-line. You know why I was arrested. 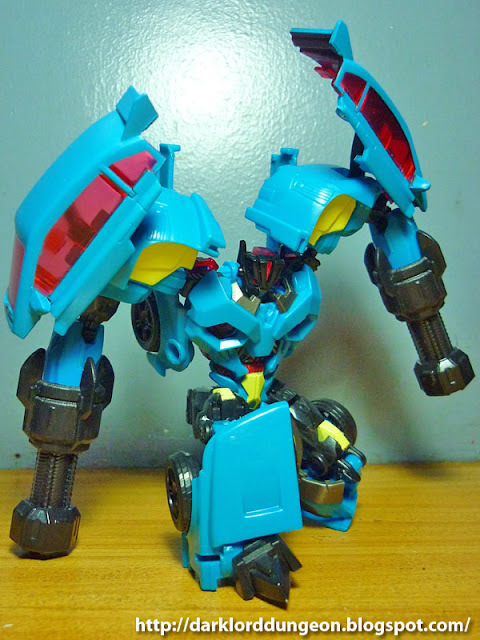 Presenting Sergeant Kup from the Transformers Prime toyline. I'm not really sure why I picked him up. I'm not a big fan of redecos (He's technically Iron Hide, his ugly mug even looks like an Iron Hide.) 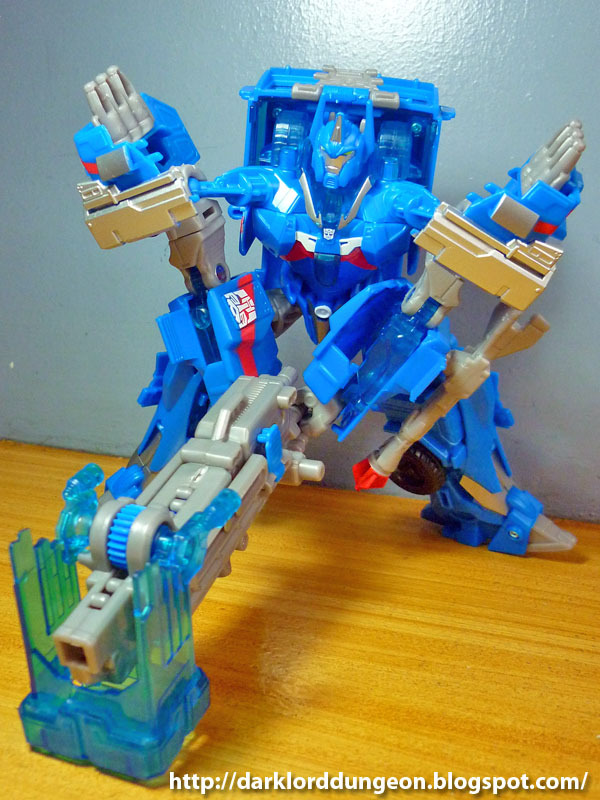 Though to be fair, he's technically not a direct redeco. The Prime Sergeant Kup is based upon the Cyberverse Iron Hide (A red/orange and black F150) which is smaller than Sergeant Kup - Though there is an Iron Hide that includes an Arm Micro Transformer named Iro that should hit the market soon which is an exact redeco of Sergeant Kup. Especially since Sergeant Kup has yet to appear in the Transformers Prime series - but who knows? Bottom line, ridiculous as it may seem, it's infectious and it's hard not to get caught up in it. Anyway, because there's a new law in the Philippines that prevents me from reviewing anything lest I be accused of libel and spend 25 years in jail, I thought that I'd pay tribute to Psy and his Gangnam Style as well as to how far action figure articulation has come over the years. 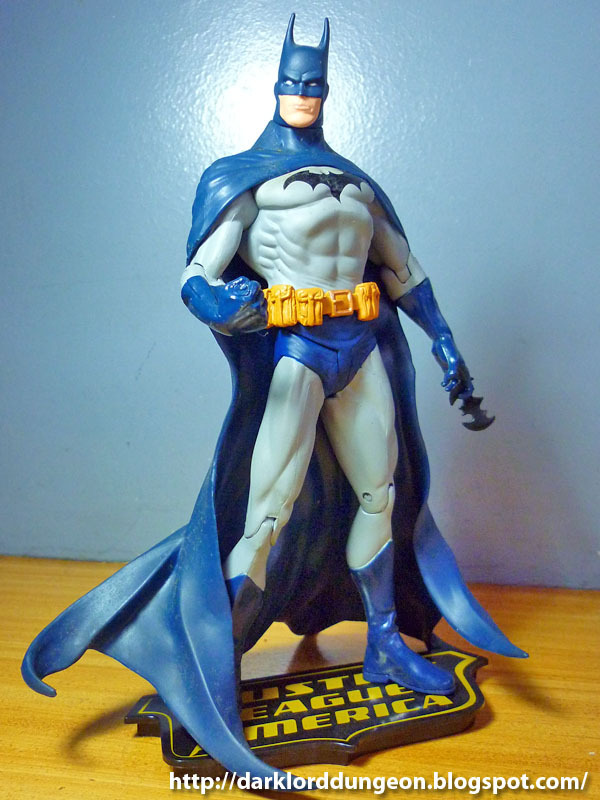 Presenting the DC Justice League of America Batman. This is the Pre-52 Batman as conceptualized by Brad Meltzer as he appeared prior to his "death" during the last Final Crisis (Flaspoint does not count as a crisis). Ironically, this particular incarnation of the Justice League of America (AKA Justice League of America Volume 2 ) was formed a year after the DC Infinite Crisis. Justice League of America Volume 2 kicked off with the DC trinity (Superman, Wonderman and Batman) selecting a new team of heroes - including deciding whether or not they themselves should be on it, and the final roster consisted of the Trinity, Hal Jordan, Black Canary, Red Arrow, Black Lightning, and because they showed up when the team was being formed, Vixen and the Red Tornado. The team disbanded following the Final Crisis and they were replaced by a next-gen heroes that included Batman (Grayson), Donna Troy, Mol-El, The Atom, Green Arrow, Cyborg, Doctor Light, Starfigre, Congorilla, the Guardian - and later Jade and Jessie Quick. Unfortunately I would not say that this is my favorite Batman. I'll discus why later. My actual favorite is the Batman from Hush. Big Bang Theory, the chronicles of Geeks, Dorks and people like me who fight dragons in their head returned to television for its 6th season last night in the United States. While I'm not really happy that Penny turned down Leonard's wedding proposal, a part of me is happy that she did because I want her for myself (what Geek doesn't?). 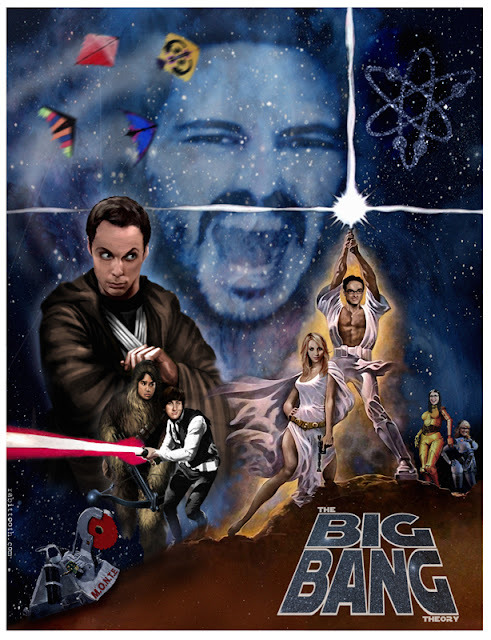 Anyway, this "Return of the Big Bang Theory" tribute art is from the mind and skill of Rabittooth, a 42 year old Digital Artist from the United States. What really strike me about the artwork is not the blatant Star Wars reference, but rather the artist's knowledge of the show which is obvious thanks to the simple nuances that are present on the artwork: From the Hello-Kitty Battlekite; to the Mobile Omnidirectional Neutralization and Termination Eradicator, to the evil laughing menace of Will Wheaton (The guy really is evil). It's obvious that Rabittooth is not only very talented, but a Big Bang Fan. Presenting the Universal Studios Singapore Exclusive Transformers "The Ride" EVAC. The last time I was in Singapore, the Transformers section of Universal Studios was a few months away from completion so I never actually got to ride "The Ride." From what I hear at best I avoided being spat at by Starscream - how or why a robotic being would have bodily fluids is still beyond me. 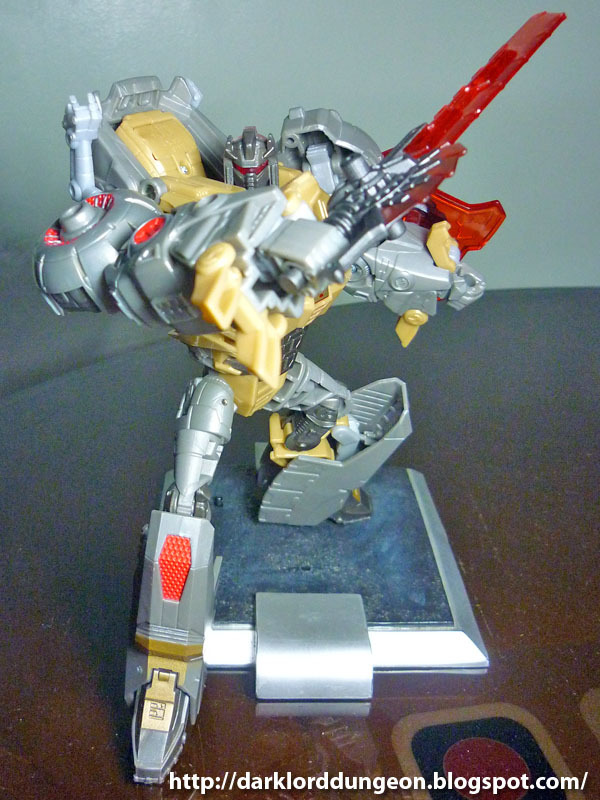 Anyway, this Universal Studios exclusive was released last June 2012 if I researched that correctly and a very good friend from Geekmatic was kind and gracious and great enough to gift me one. Presenting the Star Wars Vintage Edition Luke Skywalker. Mark Hamill celebrated his 61's birthday yesterday, and I actually debated whether I wanted to pay homage to him by reviewing Luke Skywalker - the character he immortalized and which, all of us at one time or another, have most probably wished we were - or by reviewing the character he has given a new level of creepiness to: The Joker. Yes, if you've ever cringed at the dry wheezing voice of the Batman's greatest thorn while playing either the Batman Arkham Asylum or Arkham City games, or while watching the animated series, that's the dry wheezing voice of Luke Skywalker. Mark Hamil played the role so well, I actually downloaded the Arkham City soundtrack that showcased the Joker singing "Only You". The 8th Annual Philippine Komiks Convention, Komikon 2012, will be held on October 27, 2012 from 10am to 7pm at the Bayanihan Center, Unilab Compound, Pasig City. If you liked the work of Lyndon Gregorio's clever 80's cartoon pick-up lines, he and a plethora of other local comic-book artists will be there as well. Oh and speaking of Lyndon Gregorio, do take the time to like Beerkada's Facebook page here. While waiting in the ER room a few days ago, I found myself reading the comics section of the Philippine Star where I came across this funny quip from the mind of Lyndon Gregorio in his creation "Beerkada." When I first read it, I thought "What the F...!!!" But then it hit me, the invocation to summon the Avatar of Knowledge used by Arzon, the Spectral Knight from the 1980's Visionaries cartoon is indeed a wonderful pick-up line. It sounds like a very poetic and romantic way of saying "I want to get to know you." And uninitiated young jailbaits would not know what the hell you're talking about. Lyndon may be on to something here. UPDATE: Apparently Lyndon has a website where there is a PART 2 to this Visionaries pick-up lines saga. Do visit: Beerkada.net and don't forget to like the Beerkada Comics Facebook Page. Presenting Kamakura, Roadblock and Beachhead from the GI Joe Retaliation Ninja Dojo set. 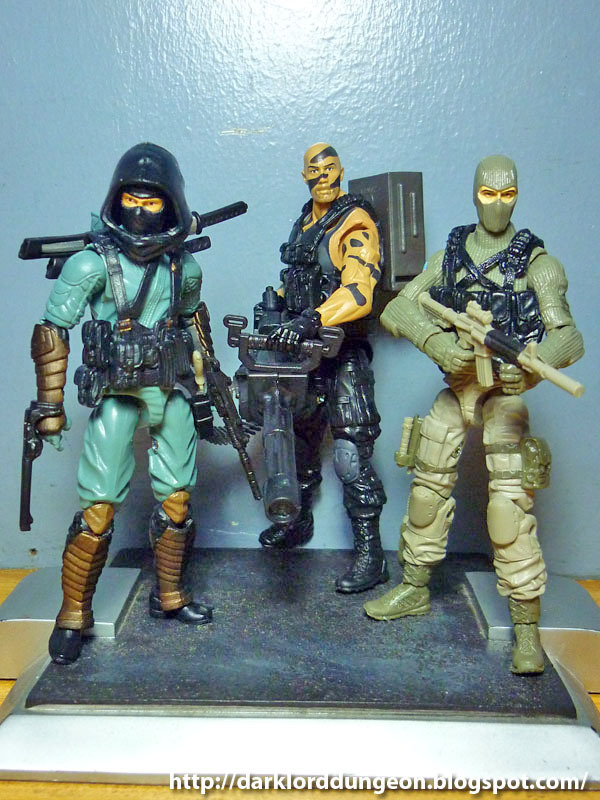 Of these three characters, only Roadblock is available individually from the Retaliation line. I'm not really a fan of the individual Roadblock, so I decided to pick up the Ninja Dojo set instead. 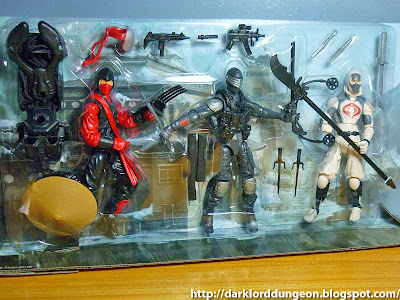 As with the GI Joe Retaliation Ninja Showdown set, the Ninja Dojo set comes chock full of accessories which is definitely a plus to the set and a definite reason to pick it up. 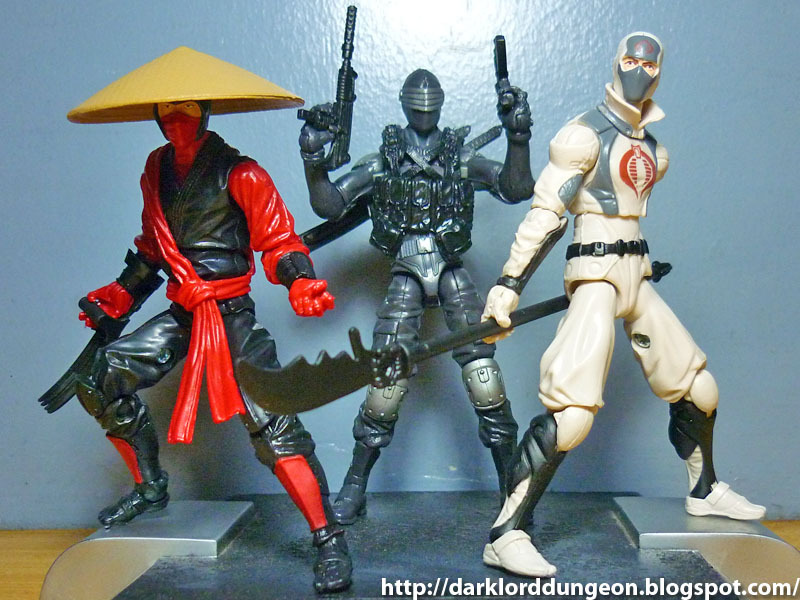 We'll go into this in greater detail later, but the Ninja Dojo set comes with some of the best - and probably some of the most fan favorite - accessories from the 25th Anniversary GI Joe series. 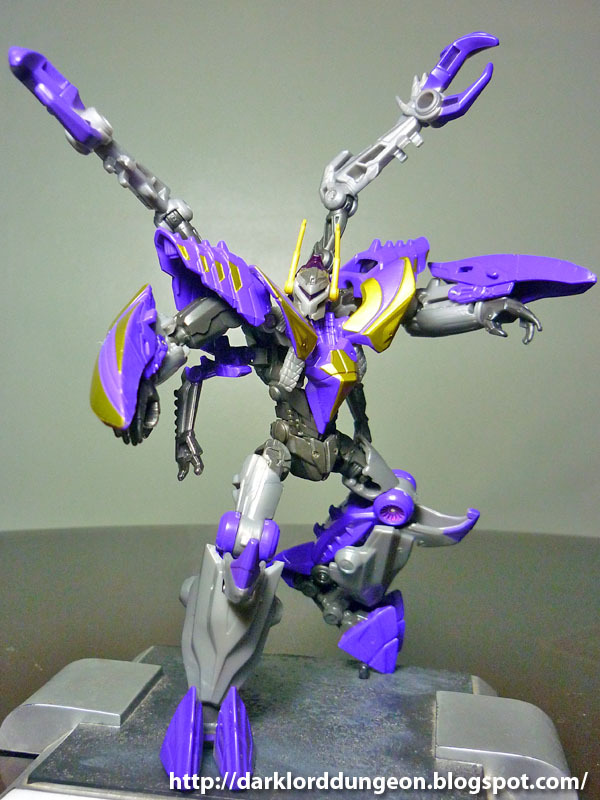 Presenting the new Transformers Prime Decepticon Rumble. The little cassette tape - if you don't know what that is, you're waaay too young to be seriously collecting toys - has all grown up and now he's a full fledged car. But I'm sure he's still going around saying things like "First we crack the shell, then we crack the nuts inside!" (The Transformers: The Movie. 1986). 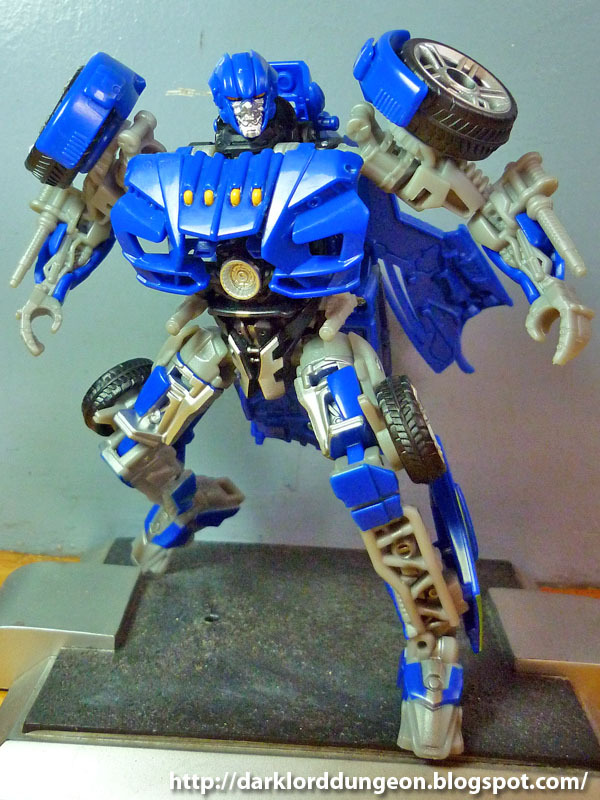 This new Transformer is also known as the Prime Revealer Deluxe Class Rumble. Not sure what a Revealer is or why they needed to call him that. But it's nice to see Rumble all grown-up - though I'll admit that a part of me still wishes he was a tiny cassette tape that could be ejected from Soundwave. 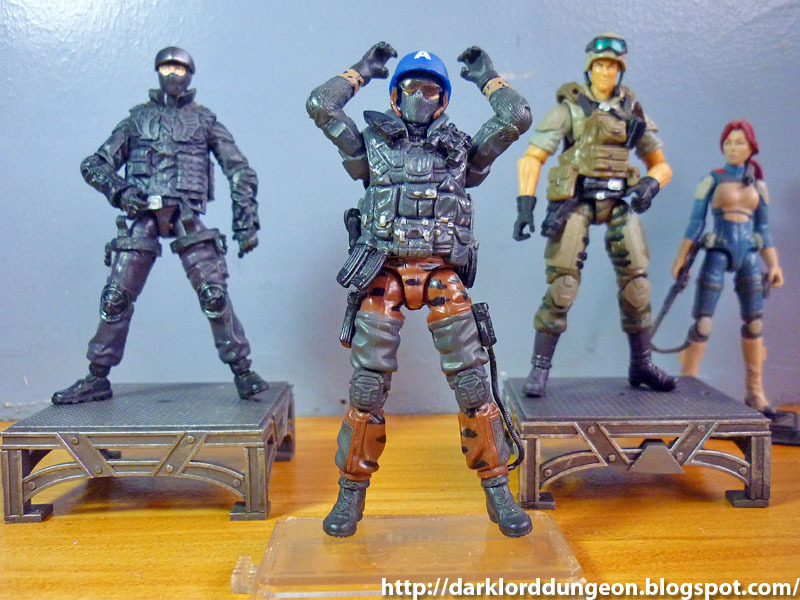 Presenting the Cobra shape-shifting mercenary, Zartan from the GI Joe Retaliation line. 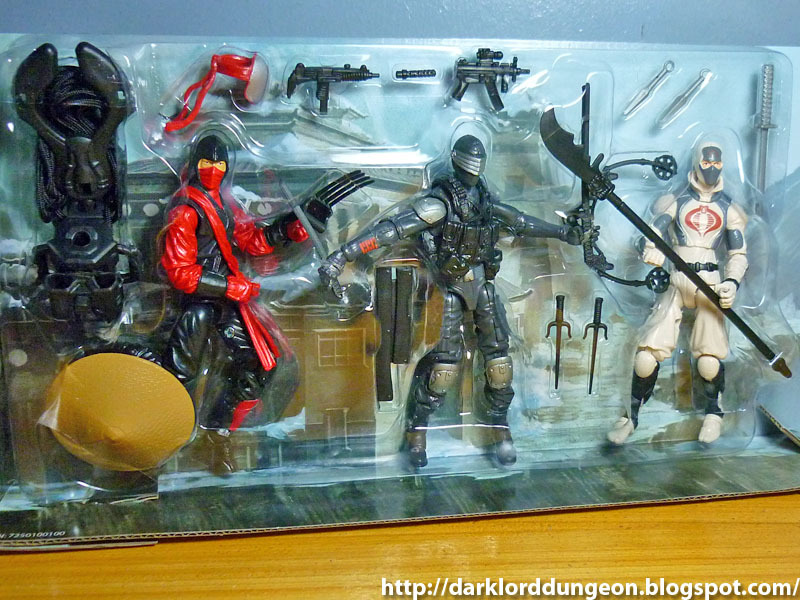 I remember being totally in awe back when I was a kid and had a 1984 released Zartan figure. The figure action changed color in the sunlight (yeah we were a generation that was easier to please)! Even Zartan's body-armor had thermal sensitive stickers that changed color depending upon the temperature, and he came with a swamp skier that also changed color in the sunlight. Unfortunately his 25th anniversary figure - which came with a scaled down version of the Swamp-Skier - does not change color. 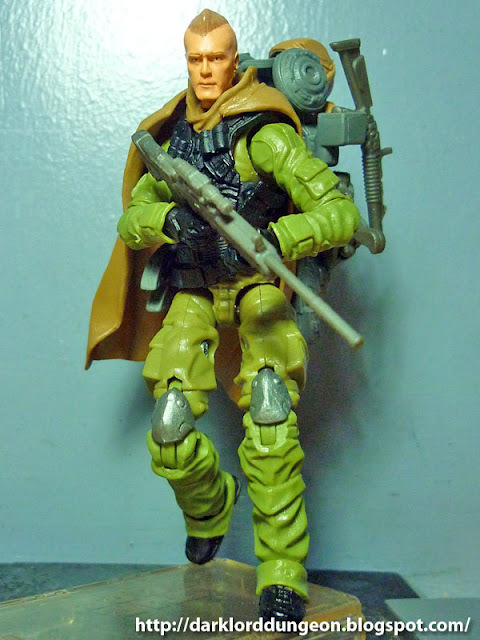 There was also a really, really cool version of Zartan released in the Pursuit of Cobra line which I have not reviewed, but can be glimpsed here. The Power-Auction will be held on Saturday, September 22, 2012 at the Torrance Marriott South Bay, Torrance, California beginning at 4:00 PM. This year, Power-Con/Thundercon has teamed up again with Auction Company TheBigToyAuction.com to sell a donated collection of one-of-a-kind Art, Signed Scripts, and Custom-Made Toys to benefit the Keep A Child Alive Charity for children affected by AIDS and HIV. Presenting the GI Joe Retaliation Trooper. Today is the 11th Anniversary of the 9-11 tragedy so I thought it would be nice to review such an iconic figure today. 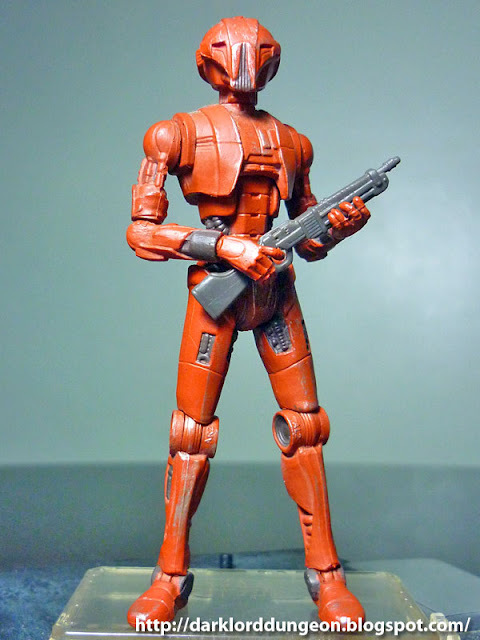 The GI Joe Retaliation Trooper is the current chase figure thanks to it's troop building value - and the fact that, if rumors are true - there's only one GI Joe Trooper in each of the currently dispatched Hasbro Boxes. I'm personally not sure if he's rarer than the Red Ninja... Just occurred to me that I have a Red Ninja somewhere and I've totally forgotten about him... anyway, personal experience indicates to me that he is rarer than the Retaliation Cobra Red Ninja. 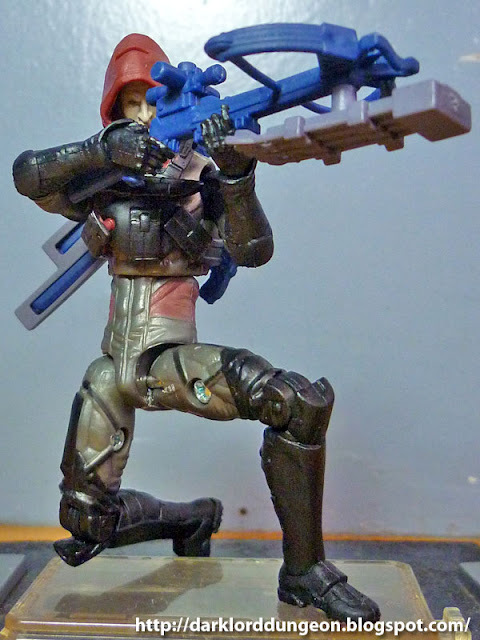 I actually found this particular GI Joe Trooper in - of all places - a bookstore. Presenting the Transformers Fall of Cybertron (FOC) Bruticus AKA the Decepticon Combaticons. The Combaticons owe their existence to Starscream and his driving ambition to become the leader of the Decepticons. The Combaticons were built as an army to serve Starscream and hid the fact that they had the gestalt power to form Bruticus until the Constructicons showed up and formed Devastator. Bruticus beat the crap out of Devastator but was taken down from behind by Menosaur - the Stunticons. Hence you will find animosity between Stunticons and Combaticons. In fact their hatred for each other is supposed to be greater than the hatred the Combaticons have for the Autobot Protectobots - their chief rivals. 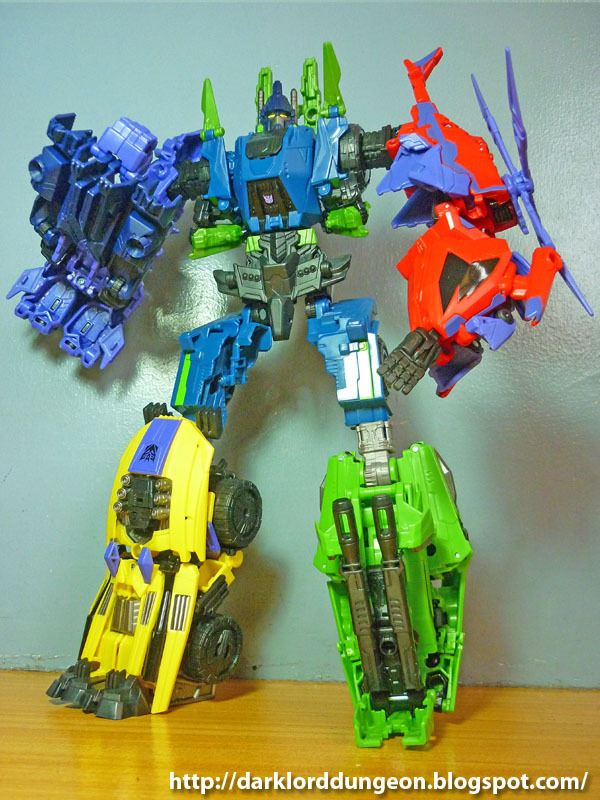 What's so interesting about FOC Bruticus is that he's actually built mostly out of some of the most disturbed Decepticons around. They need therapy. 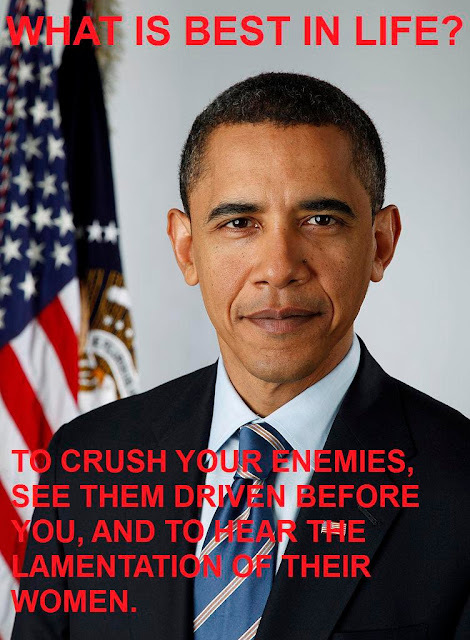 Except for their leader Onslaught who is a cunning leader and tactician. It's actually ironic that the Combaticons' gestalt Bruticus is a berserk who has to be told what to do. 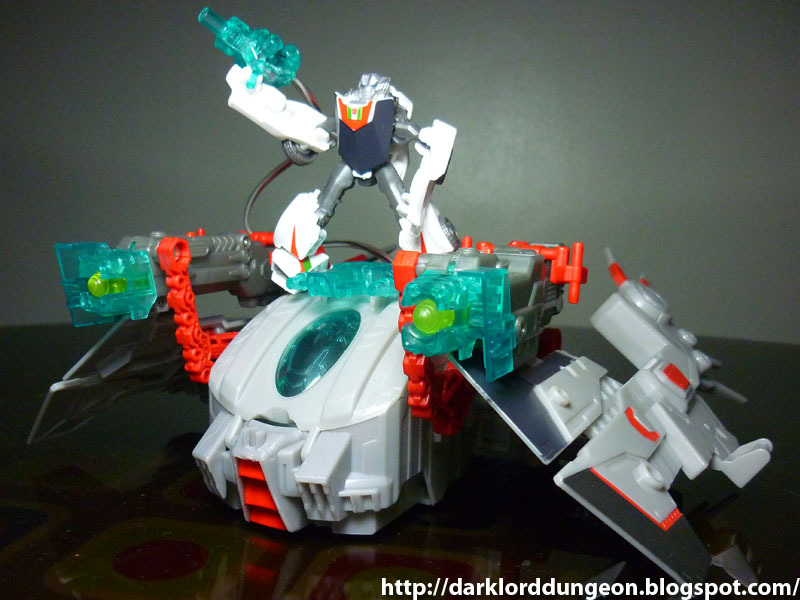 If he had Onslaught's brain, he would be far, far deadlier. Presenting the new G.I. 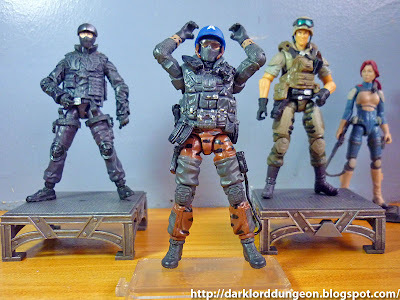 Joe Retaliation Cobra HISS Tank! It is still unknown as to whether or not this latest incarnation of Cobra HISS Tanks (Technically H.I.S.S. Tanks or High-Speed Sentry Tanks - the original H.I.S.S. Tanks had a maximum speed of 120kph) will make it into the actual Retaliation movie and this is not the version that transforms into Shockwave (SDCC 2012 Exclusive) - else the main cannon would be very different. 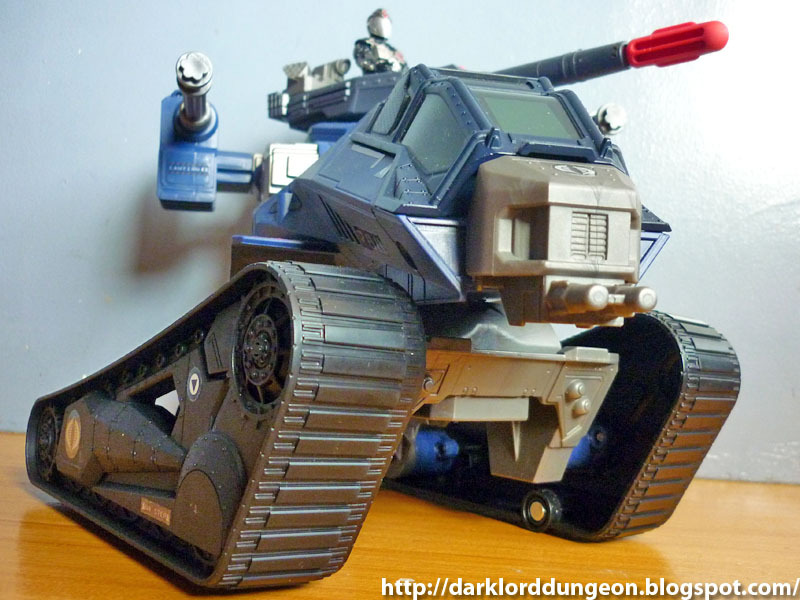 The Retaliation COBRA Hiss Tank is technically therefore the Mark VI version of the HISS Tank as - while it has some similarities - it is markedly different from the Mark V version of the HISS Tank that was released as a part of the G.I. Joe Pursuit of Cobra Toyline. 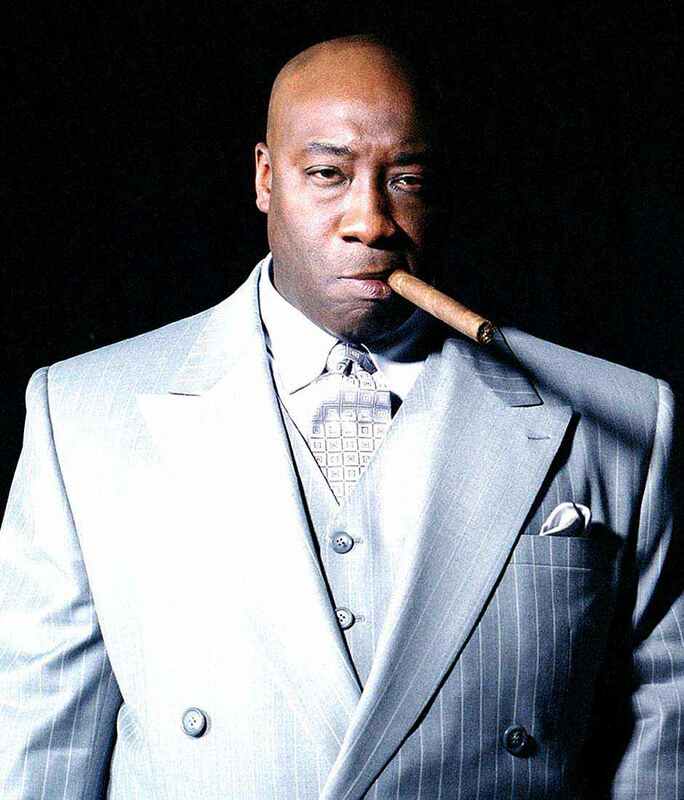 A giant - literally - has moved on as Michael Clarke Duncan died of a myocardial infraction today, September 3, 2012. He was 54. May he rest in peace. One of cinema's literal gentle giants will always be known for his deep reverberating voice and his gentle welcoming smile. For more details, visit the Chicago Tribune. 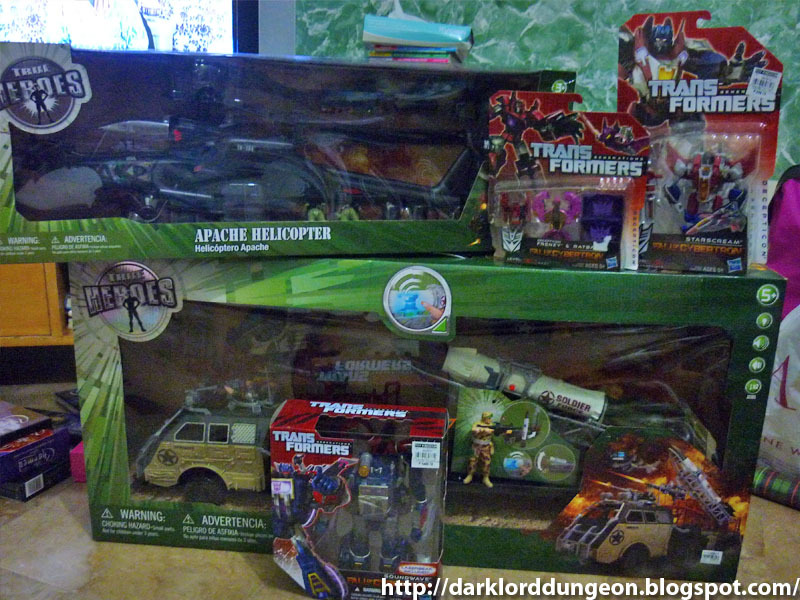 Presenting the Transformers UFO (Get this - Unknown Factory Originals) War Axe and Shield. I had a discussion from a few members of Cybertron Philippines while setting up for the Toykingdom Toy-Expo 2012 regarding the third-party accessories being released into the market and how Hasbro and Takara were bringing the full weight of the law down on them. My argument was that both Hasbro and Takara should end up working instead with these small organizations since there is absolutely no such thing as a perfect toy. 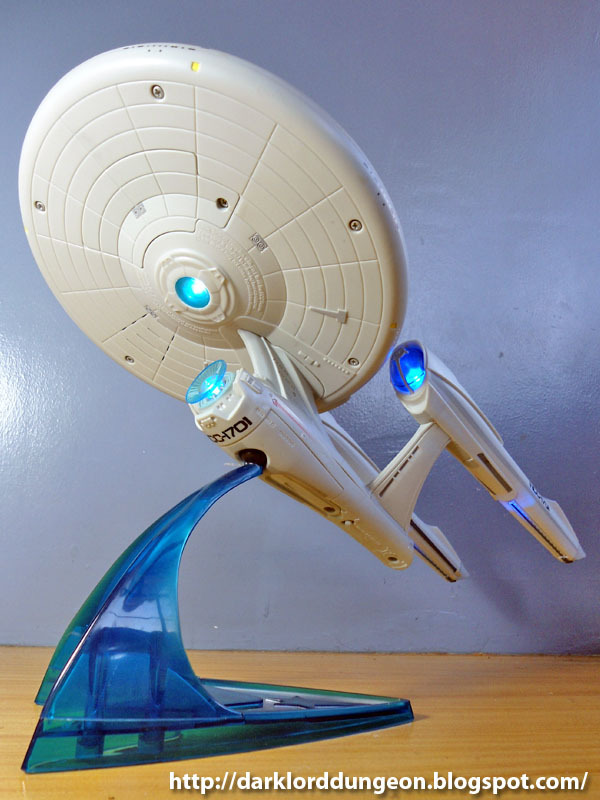 3rd Party manufacturers are one of the reasons why collectors like us continue to patronize original toys. 3rd Party manufacturers make "props" that keep things interesting and fun. Presenting the 2012 Star Wars Clone Wars Aayla Secura action figure. I have to say that I am NOT a fan of the Clone Wars primarily for their distorted view of the human form. It just doesn't fit well with the rest of my collection. But damn! 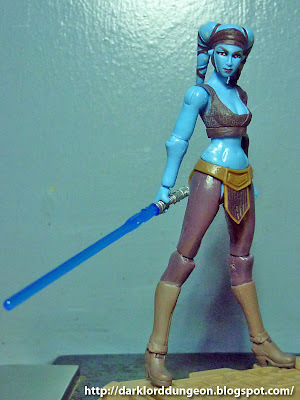 Jedi Knight Aayla Secura looks even hotter distorted - what with that waifish waist and bodacious booty! 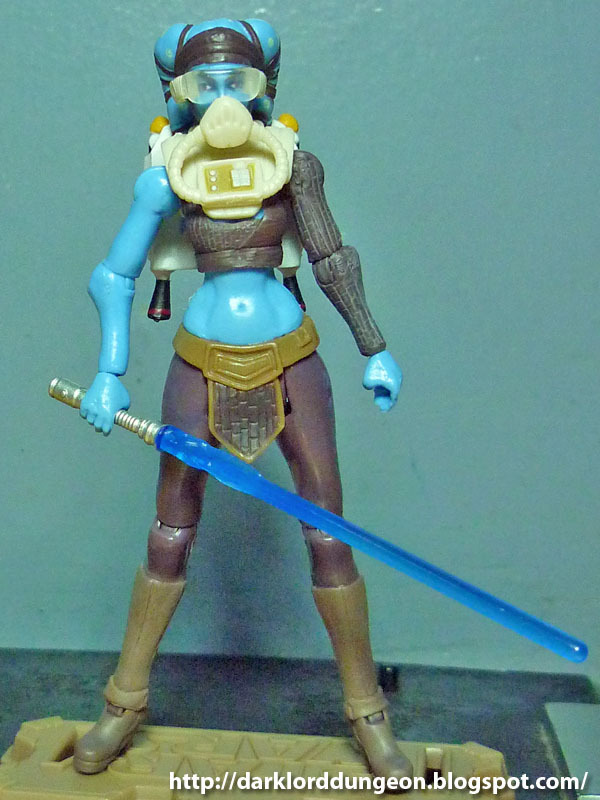 Unfortunately, George Lucas has something against Twi'leks in general (Jedi Knight Alema Rar lost an arm and fell to the Dark Side; Rogue Squadron member Nawara Ven lost a knee and became a lawyer, and; Oola (la) was eaten by a Rancor). We all saw Jedi Master (Newly minted) Aayla Secura fall after Order 66 was given to Commander Bly and the 327th Star Corps in Episode III. Happily, despite the overkill that followed, Commander Bly made sure that his first shot made the death of his friend as quick and as painless as possible. 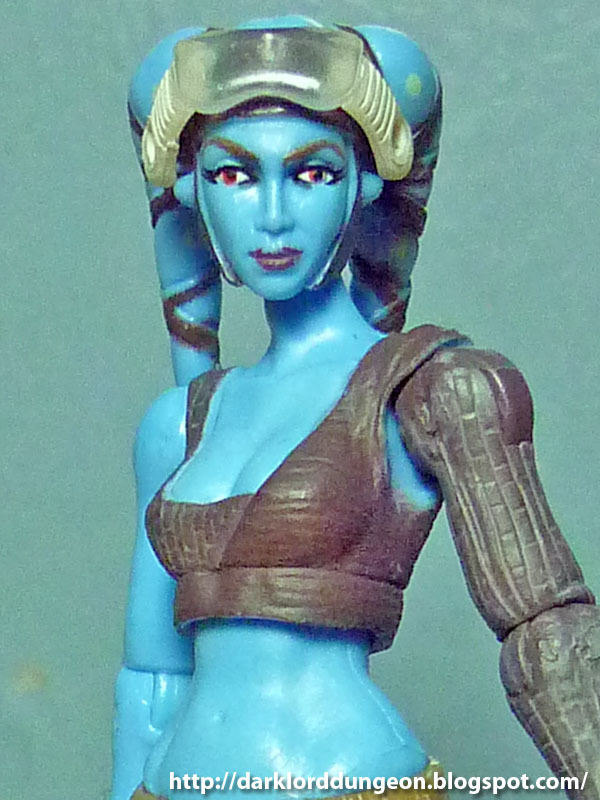 Aayla Secura was just a newly promoted Jedi Knight when she fought in the battle of Geonosis in Episode II. So her Master status at her death is testament to her abilities and fighting prowess.